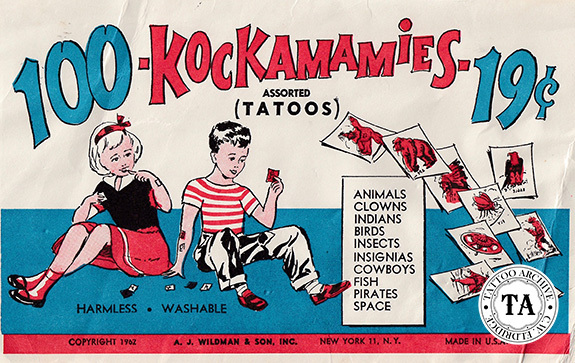 The early history of temporary tattoos is vague. However, by the turn of the century temporary tattoos or transfers were beginning to appear. Surely the first ones were the food coloring style that could be easily transferred with spit or water. It is possible that Cracker Jacks® was the first to circulate these transfers. The popcorn and peanut confection was introduced to the public in 1896. In 1912 "A Prize in Every Box" was introduced when toys were inserted into every package. Some of the early prizes could have been temporary tattoos. Today Cracker Jacks® include food coloring style tattoos as prizes in their snack. 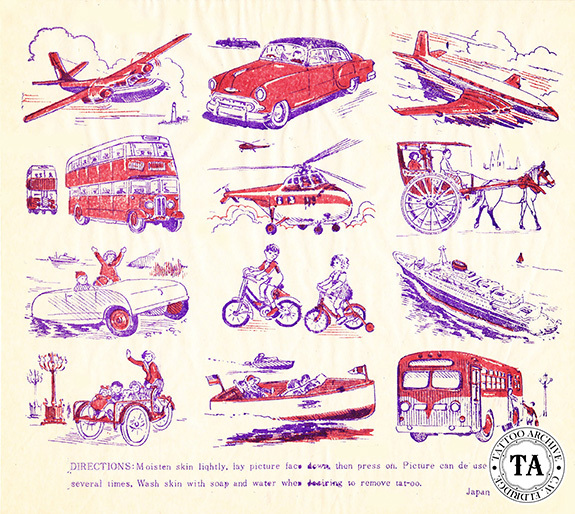 In the 1950s, sheets of these food-coloring designs were sold for 1 cent each. I remember them from my childhood in North Carolina. Baseball cards had been in circulation for a long time before Baseball Tattoos hit the market in the 1970s. 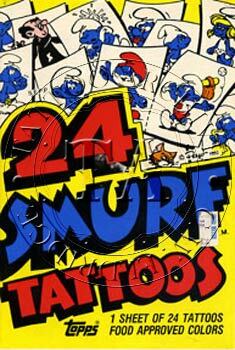 Smurf Tattoos are another food coloring item from the giant of trading card companies, Topps®, circa 1980s. Scratch and Sniff Tattoos are one of the most unusual temporary tattoos in the Archive's collection. These designs are coated with the famous 3M Microfragrence® material, hypoallergenic for sensitive skin, circa 1980s. 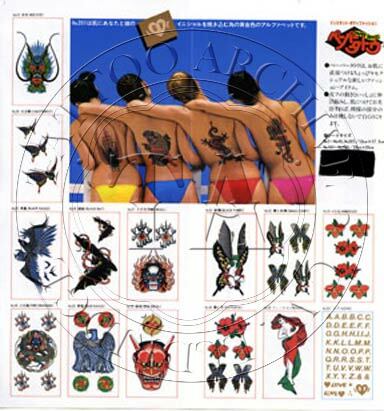 In the 1980s, Ole Hansen, a world famous tattooist from Copenhagen, teamed up with the Dandy Novelty Company and together they produced some temporary tattoos. 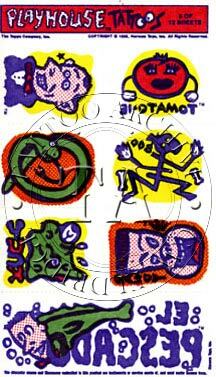 Borrowing a lot from Ole's tattoo flash, these temporary tattoos are a look back to the old time spit designs. These tattoos are made from food coloring and have wordless instructions for the application of these transfers. Spurred on by an increased interest in tattooing during the mid1980s, the look of temporary tattoos began to change. This general interest, combined with Hollywood's desire to have a product that would "tattoo" a person temporarily for the movies, encouraged inventor Keith R. Relyea from St. Joseph, Wisconsin, along with Minnesota Mining and Manufacturing (The 3M Company) to patent a method of printing images on a translucent film that could then be transferred to the body. This patent, #4,594,276,was filed April 9, 1984 and accepted June 10, 1986. Over the years tattooists have worked with temporary tattoo companies to produce a product that truly has the look of the real thing. The latest offering from this collaboration is the Official Tattoo Brand, by J.D. Crowe. 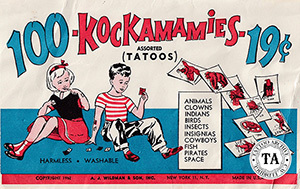 Considered the Cadillac of temporary tattoos and sold under the name Paper Tattoos. Thanks to the new patent on the film used for these temporary tattoos, their popularity as body decorations are at an all time high. Being more realistic and longer lasting, these modern versions have become the choice of many less committed tattooees.